Hey there! 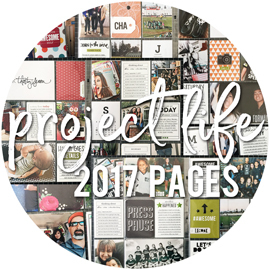 So earlier this year, in THIS post, one of the things that I said I was going to focus on this year was keeping up with my Project Life albums. I talked a bit about what I did last year, and how I have yet to finish a single week in my 2016 albums. And I also mentioned that I was debating whether I wanted to do Project Life with physical products, or digitally, with the Project Life app. I really went back and forth on what I wanted to do, and even tried creating a few spreads in the app for the first few weeks. I ended up ordering all of my January photos, still not knowing what my plan would be. It wasn't until a few weeks ago, that I finally made up my mind to go with the physical album. Here's a look at my week one spread. I'm doing 9x12" again, as I just really love that size for doing Project Life. Last year, I cut down a 12x12" American Crafts album to 9x12" and also cut down a ton of my pocket pages to fit. I loved that I ended up with a mix of different size pages within the album - some were 4x12", some were 6x12", some were 7x12", some were 8x12", and then some were the full 9x12". For most weeks I had at least 2 spreads for the week, since I was using lots of smaller sized pocket pages within the album. This time around, I'm using actual 9x12" albums from Seven Paper (by Studio Calico), along with true 9x12" pocket pages. There's a few styles of pocket pages, but so far, I've only used the two shown above. I love the protector that has all 3x3" pockets, but that will take a little more planning, since I can't order 3x3" photos right from my phone - and I'm still using the FreePrints app to order all of my photos. I'm planning on sticking to just one spread per week, to keep it simple. Another thing I decided to do was to use these Weekly Edition Journaling Cards, from One Little Bird, for my weekly title cards. They're simple and easy, and I love them. When I go to do my photo order, I simply upload the cards for the month to Dropbox, and then I grab them from the Dropbox app on my phone and add them to my FreePrints order. I could also print them on cardstock, but having them printed right along with my photos is so easy. I start out by adding in the title card, the calendar card (seen below), and then my photos. From there, I start working on my journaling cards. My plan as of right now, is to add just two additional filler cards per week. These will be more decorative cards, like the aqua "love this" card above. This particular card had a lot of empty space on the bottom, and since I wanted to incorporate a bit more yellow into the spread, I added a yellow chipboard star. In my Project Life album for 2016, I spent a lot of time working in fun filler cards for all of the pockets without photos. A lot of them were journaling style cards, where I intend to add my journaling. The thing is, I know how long it would take me to actually add my journaling to those cards, should I want to print it from the computer. And truth be told, I would much rather NOT use my own handwriting. Mainly because I tend to write on the bigger side, and I'd never be able to fit all that much on those cards. So I decided that I'm going to stick to using digital journaling cards. I've used these in several pocket page projects over the last few months, and they're super easy to do. I have quite a few journaling card kits, from both Ali Edwards and Cathy Zielske, and I will probably stick to those most of the time. While working on these first few weekly spreads for 2017, I really tried not to over think things. Adding simple little embellishments, stickers, and alphas, is a great opportunity for me to really dig into my stash - whether it's newer products or products I've had for years and years. These alpha stickers from Doodlebug are a perfect example. I've had them forever, and I have always loved them. But I can't remember the last time I've even used them. But they were perfect for adding to the empty space in this photo. Most of the digital journaling cards that I'm using are pretty simple - and have lots of white to them. I mentioned earlier this year that I had taken Cathy Zieske's Scrapbook Your Year class, and one thing I really liked on her pages was that the majority (I want to say all, but I could be wrong on that) of her filler cards were all black and white. It simplifies that part of the process, as you're not spending time trying to find filler cards and journaling cards to match your photos. That's not to say that I won't incorporate colors into those filler and journaling cards though. One of the digital journaling cards that I'm using a ton is the one shown above. It actually does have a little quote at the top of the card - but I simply removed that, so that the top of the card is blank, and I still have all of the lines to type my journaling on. This will allow to add something to the top of the card to tie in my photos. This could be a digital stamp or brush, a physical stamp, or a sticker - which is what I added to this card here. The "this is awesome" card is from one of Ali's Story Kits, and the colors were perfect for this spread, so I kept it there. Turns out, the aqua and the yellow on this journaling card ended up dictating the colors I used on the rest of the spread. Since the Project Life spreads can end up with a wide variety of colors, depending on what photos you have, it's nice to just pick a few colors to focus on with the rest of your products. The calendar card is something that I intend to add to each week's spread. Susan Weinroth used to work one into every weekly spread in her album, and I loved the idea. I decided to use the Project 52 Fresh Calendars from Becky Higgins - I'm linking to the digital kit thru her site, but I'm actually using the kit on the Project Life app. I use the app to put two 3x4" photos on a 4x6", for ordering. And you can also use the app to do the same thing with any of the cards in the app. So I can put two of these calendars on one 4x6", and print them right along with my photo order. One thing that I do want to do is highlight the week somehow. Since these are printed on photo paper, I'm not sure what I could use to do that. I'm actually going to try doing something with these in Photoshop, before doing my next order. Use a digital brush or something to highlight the individual week that each spread is for. So I will be switching these cards out once I figure that out. My goal is to keep these pages simple and easy. And I also would prefer to keep them fairly flat, so as to not bulk up my album too much. I did include several chipboard pieces on this week one spread. Here's a trick for you. A lot of chipboard pieces come with adhesive, but they don't actually stick that well. Or like these here, the adhesive literally dries up after a few months, and you have to peel that layer off anyways, before you can actually adhere it. I simply peel off a few layers of the chipboard, until I have a relatively flat chipboard piece to work with. Don't get me wrong, I love chipboard. But too much in an album will bulk things up, which is why I prefer to make my pieces thinner. Just Because: Oh. Em. Gee. So this layout is about my youngest, Sarah. She's messy by nature, and it drives me insane. Because I'm the complete opposite, and I've been trying to instill good cleaning habits in her since she was a little girl. She's going to be 18 years old in a few months (crazy! ), and it still hasn't sunk in. Sure, she has her moments when she gets bitten by the cleaning bug, and before I know it, her room looks amazing! But the majority of the time, it's a disaster area, and her piles and messes spill out into other areas of the house. I had a few photos that inspired me to create this layout. I actually started this layout almost a year ago. I had my patterned papers picked out, background and title die cut, but just never got around to making the layout. I even debated a few times not doing the layout. But every time I thought about not doing it, I would then change my mind right before putting all of the papers away and put them back in my to-do pile. My patterned papers are all from either Dear Lizzy or Amy Tangerine. It's kind of odd how I came up with these papers, or even these colors. My photos were pretty busy, and there weren't any distinct colors that stood out to me. I guess I went with the aqua patterned paper as the walls in Sarah's room are aqua, at the time I had an aqua valence about the kitchen window, and there's one aqua piece of clothing in the laundry pile photo. I actually stepped away from the circle backgrounds that I am slightly addicted too, and used a diagonal striped background from Kerri Bradford's Background Basics kit. The aqua patterned paper is actually a world map pattern, but the photos and patterned paper strips cover up the main part of the map pattern. I had this day of the week patterned paper, from Dear Lizzy, out as a possible paper to work into the page. I really wanted to use it, but it wasn't working out. Until I decided that instead of doing a 3x4" journaling block in between the photos, which was my original plan, I would add my journaling below the photos in a long strip (that allowed me to say more anyways). So I was able to work in a block of that patterned paper in between the photos. Yesterday, I shared my layout about "golfing with mom", and today I'm here to share my layout about "golfing with dad". Which pretty much looks the exact same, design wise, as my layout from yesterday. I had four 3x4" photos for each layout, and had the same cut files for my title in mind, so it made sense to just use the same design. There's no reason to feel like you have to re-invent the wheel every time you sit down to scrap, am I right? Golfing with dad is a lot different from golfing with mom, as it involves going to a full fledged golf course. Years and years ago, the four of us went on a real course, and it was an interesting experience for two of us (that would be Alyssa and I). I'm so glad they took some photos while they were out there, so that I could document their little adventure too! I'm going to repeat myself here, from yesterday's post, but I want to make sure and mention what I used here. Since the top part of my layout was going to be just white cardstock, I die cut a circle background - from Kerri Bradford's Background Basics kit - from white cardstock to layer on top and to add some subtle interest. I die cut the full 12x12 background piece, and then used half on each of the two layouts. I've mentioned before that whenever I can't find the word I'm looking for as a cut file, I turn to Kerri's Weathered Door Alpha kit to create my word. Which is what I did for the "golfing" part of my title. On this page, I used a mix of patterned papers from Close To My Heart and Amy Tangerine. I used Kerri's All In The Family kit for the "dad" part of my title, and used some tiny alpha stickers between the two die cut words to complete my title. Hey everyone! 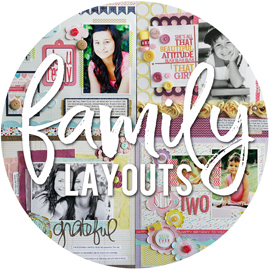 I am back this week to share the other half of the layouts that I created the other weekend. It turns out, that all three of the layouts I'm going to share this week have a very similar design to them. In fact, the layouts I'm sharing today and tomorrow are pretty much the same layout - just different photos and different papers. Two summers ago, both Joe and I had taken the girls out golfing, on two consecutive days. We ended up with a small handful of photos from each of the golfing outings, and I thought it would be fun to do a layout about mom's style of golfing and dad's style of golfing. I even tossed around the idea of combining the photos and story on a two page spread, since the colors in the photos tied in nicely with each other. But in the end, decided to make two separate layouts. So what is my version of golf? That would be miniature golf. There's not much to do around here, but the girls and I were trying to do a little day outing, and this is what we came up with. It was hotter than heck out, and we went during the hottest part of the day. We were sweaty, cranky, and just plain old hot. But we still had fun out there. Since the top part of my layout was going to be just white cardstock, I die cut a circle background - from Kerri Bradford's Background Basics kit - from white cardstock to layer on top and to add some subtle interest. I die cut the full 12x12 background piece, and then used half on the two layouts I was working on. I've mentioned before that whenever I can't find the word I'm looking for as a cut file, I turn to Kerri's Weathered Door Alpha kit to create my word. Which is what I did for the "golfing" part of my title. I used a mix of patterned papers from Close To My Heart, Basic Grey, Dear Lizzy, and Studio Calico. 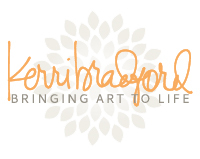 I used Kerri's All In The Family kit for the "mom" part of my title. I don't think this paper photographed well, as it's actually a great purplish-pink color that ties in nicely with the colors in my photos and other patterned papers. I used some tiny alpha stickers between the two die cut words to complete my title. I remember going miniature golfing with the girls and Joe years ago, and I would take TONS of photos during that quick 18 holes. I find that I take way less photos now that the girls are older. That might be because they won't "allow" me to take as many as I used too ;) But I am glad that I made sure to snap a few photos while we were out together. Just enough to document our little outing. This was another layout where I tried to add some simple embellishments, but everything looked forced. In a lot of ways, I feel like I've simplified my style. Especially now that I'm not working for a manufacturer, where I'm told to pile on the embellishments and make the product the focus of my layouts. Now I can make my pages all about the photos and the stories, only adding what I truly want to add. Which these days, is mostly patterned paper and die cuts. It works for me, so I'm cool with it. Happy Friday everyone! I'm back to share another new layout that I created last weekend. This is another example of a layout "in the works" that I have had sitting around for ages. I originally had larger photos - I had an extra photo which was 4x6", and the two photos shown here were both 4x4" in size. And I could just never figure out what to do with them on the page. I'm glad I finally got smart and just printed them as 3x4" pics, since I knew I had the fun envelope to work onto the page as well. Alyssa's sorority has an annual Mom & Daughter Tea every year, and these photos were from the one in 2015. Sadly, we didn't get to attend the one this past fall, as Alyssa had a wind ensemble event that day. One of the things we did at the tea was to play this "Mother Daugher Jeopardy" game. Where we both answered questions about the other person, and then went thru them to see how well we knew each other. I kept our sheets, knowing that I wanted to save them to look back on. And I knew exactly how to incorporate them onto my layout. I have some of these fun envelopes left over from a super old Creating Keepsakes kit-of-the-month thing. I have used these numerous times on layouts, and they're just a really cute way to tuck something out of sight - but still include it on your project. I went thru the envelopes I have left, and picked one with the best word at the top and the best color that would work with the photos. I don't think I would have went with orange, just based off the photos, but I knew I could make it work. Once I had the envelope picked out, I grabbed my photos, and set out to find some coordinating patterned papers. That's pretty much how I start all of my layouts. Patterned paper choices come first. I knew I needed some orange and yellow, to tie in with the flap on the envelope. I also came across this cool brown chevron woodgrain patterned paper, from Pink Paislee, and it looked really good with the photos and the orange and yellows. I also wanted some sort of light blue to tie in with my cardigan - and the couches in the sorority house, that were pretty visible in the photo of Alyssa and I. I still can't decide if the heart and polka dot patterned papers (from Lawn Fawn) are grey or blue, if I'm being honest. But they work. Since I had to work the envelope into the page design, I figured the easiest way was to arrange the envelope and the photos across the center of the page. I matted the envelope on the polka dot patterned paper, and adhered that to the side of the page to start with. And then I randomly cut the rest of my patterned papers to varying sizes, and layered them across the page, adhering the photos on top. I feel like nine times out of ten, I die cut my titles. And I really did try looking for some cut files to use for my title. But in the end, I decided to just use some alpha stickers to create my title on the envelope front. I love these tall and skinny alphas from Jillibean Soup, but was short one lowercase letter to spell out my title. So instead of only having one uppercase letter, I just made sure to use a few uppercase as I was creating my title. Once again, I kept my embellishments super simple. I added a few enamel dots to the envelope. I was going to sprinkle some more on other areas of the page, but again, didn't want to force them on, since I was also fine with it just as it was. I did end up adding the two fun arrow clips, as they matched the page and added a little something, something to the side of the envelope. I'm so glad I finally got around to documenting this fun afternoon with my girl. It may have taken me over a year to get around too, but feels good to have it done and in the albums! Hey all! So, I seem to remember sharing a peek of this layout "in the works" well over two months ago. It's kind of crazy that I had my photos printed, patterned paper picked out, title and extra pieces die cut, and my journaling was even printed - and yet it took me over two months to get around to assembling the layout. That's just how I roll sometimes, I suppose. These photos are from Thanksgiving 2015. Hence the title ;) They were the only photos I even took that day, and I knew that I wanted to scrap them. Sarah and her boyfriend at the time, Juan, sadly broke up about two months after these photos were taken. But I didn't want to leave the photos of the two of them out, just because they aren't together anymore. He was part of our day and part of her story. 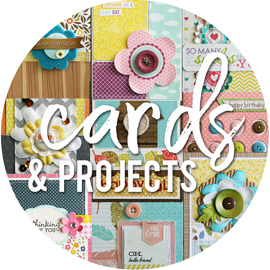 The digital 3x4" cards, from Kerri Bradford's Hello November kit, were the starting point for this layout. I printed out two of them, and then picked my patterned papers from there. I ended up with a mix of Jillibean Soup and Fancy Pants patterned papers. I also die cut two 3x4" background type pieces, both from patterned paper, using Kerri's Life Additions: Background kit. I've used this design before, on several layouts - where I line up my 3x4" photos across the page, and then tuck 3x4" cards, papers, or die cut pieces in along the top. I die cut my title from patterned paper, using a cut file from Kerri's Grateful kit, and then set out to find some number stickers to add the year to the page. I had a hard time finding any stickers that would match, or that would fit the space I had to work with. So I ended up die cutting them from cardstock. And while I toyed with the idea of adding some simple embellishments to the page, in the end I decided to leave it as is. Everything I was looking at, and trying on the page, looked forced. And I'm totally ok with simple pages, since it's really about the photos and the story when you get right down to it! A funny thing happened. After sharing that digital layout the other day, using the Project Life app, I woke up the next morning with this strong urge to scrapbook. With photos and paper. I have this big stack of brand new patterned papers, from brand new collections, that I'm dying to use. So while the daycare kids were napping, I tried my hardest to find some photos that I could scrap with the new papers. I was drawing a blank though, and decided not to force it. Instead, I decided to re-visit a stack of "in the works" layouts that have been pushed to the side for ages. I had photos printed, and matched up with patterned papers. I had already die cut titles, and/or backgrounds, for some of the layouts. I had even printed journaling for a few of them. I had just never taken the time to create the actual layouts. I pull them out all the time, and then just drop them back in the pile. 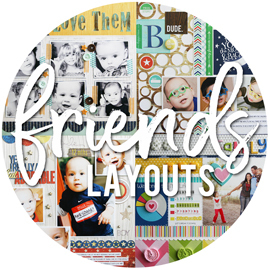 I'm happy to say that this weekend, in just a little over 24 hours, I created 6 new layouts! This layout was one that I had started back in November I believe. I don't do too many Christmas layouts like this, as I usually do a two page spread, using all of our photos from the holiday together. But I really love these photos of the girls, so I thought they deserved their own page. I have a container that I keep all of my Christmas products in (not all I should say, but most), so that's where I usually go to first when I start any of my Christmas layouts. I have plenty of older products in there, and that's exactly where these patterned papers came from. It's a mix of older Heidi Swapp and Studio Calico, with the newer green dotted Echo Park paper added in. I die cut my title from patterned papers, using a few cut files from Kerri Bradford, and finished off the title with some Simple Stories alpha stickers. And as usual, I lost track of the dot to my "i", so I just added an enamel dot in it's place. After matting my photos on the green dotted patterned paper and the black star patterned paper, I wanted to mat it on the red star patterned paper, as it was the perfect match to the red patterned paper that I die cut my title from. But I only had a piece that was 4x12" to work with. So I trimmed it up into eight smaller pieces, and just arranged them to create the look of a mat. Problem solved. I love a good white background. But I also love if it has a little interest to it. Which is why I love to add white die cut backgrounds to my white cardstock pages. And anyone that knows me, knows that I love the circle backgrounds. I know I use the same ones over and over, but they're my favorites, and they're what I love! I don't do too many layouts without journaling, but this layout didn't really need any. Just a fun layout to show off two favorite Christmas photos of my girls! CHA happened a few weeks ago, in Phoenix, Arizona, and for the first time in five years, I was able to attend the show. 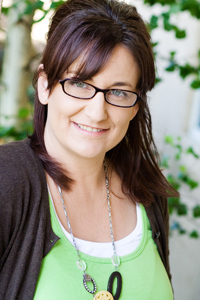 Mendi Yoshikawa started Sunny Studio Stamps, her very own stamp company, a little over a year ago. I've known Mendi for several years, and was totally up for it when she asked if I, along with Becki Adams, wanted to come out and help her in her booth. This was her first time having a booth at CHA, and she did such an awesome job with it. It's hard to see all of the booth, in this photo, as we're blocking some of it. But Mendi created every single card in the booth! I was seriously impressed! Becki and I were able to sneak out of the booth here and there, to walk the floor a bit. In all of the previous years I attended CHA, I was never good at taking photos at the show. So I made sure to get lots of photos this time. I made sure to stop at the Heidi Swapp booth, as I wanted to make sure to finally meet Kim Jeffress. We've been fans of each other's work for years, and she was even on the Bella team one year, but we never ended up at the show at the same time. It was so nice to finally meet my Australian friend in person after all these years. It was also nice to meet Jen Evans, who was just the sweetest. I wish I had gotten some pictures with the rest of Heidi's team, as a few of them are designers that were either on the Bella team, or on Kerri Bradford's team with me. We had to stop by and see Vicki Boutin, as she was there with her brand new mixed media collection thru American Crafts. Vicki is so full of energy, and she's always been a blast to talk to and hang out with. And I loved seeing her excitement for her new products. She might even convince me to get a little "messy". We had to stop by and see Shimelle, as she's got the cutest new collection with American Crafts. I want to say that it was one of my top two picks at the show, actually. I already have it all here, and I need to find some time to play with it soon. So good to see the lovely ladies from Scrapbook & Cards Today. I've met Catherine before, and she is just the sweetest thing. Megan and I go way back to my Creating Keepsakes days, and I have worked a ton with her over the years, including teaching at CKU's together. She's just awesome. And I was excited to finally meet Nicole Nowosad, after our years together at Scrapbook & Cards Today, and her year on the Bella team. She's got the absolute cutest accent, and I could listen to her talk all day. Amy Tangerine and Liz Kartchner are always stops for me. They are both so genuinely nice, and it's always nice to chat with them and check out their new collections. I know I've said this in the past, but I can't remember if it was on my blog or on Instagram. When I sit down to scrap, with no guidelines and the freedom to use whatever I want to use - I've noticed that the majority of the time, I turn to their collections first. Always a fan of their designs. Maggie Holmes and I go way back too. From our years together on the Making Memories design team, as well as our years together on the Creating Keepsakes Dream Team. She is amazingly talented, and super sweet. It was also fun to see Jen Gallacher again, as it's been several years since I've seen her. I've always enjoyed chatting with her, as she's super knowledgeable about the industry, and always has good tidbits to share. The Jillibean Soup girls! I just love them. Jill, Summer, and Kimber. I spent two years on the Jillibean Soup design team, shortly after they came into the industry, and I just loved it. I have always said that a stop by the Jillibean booth felt like "home" to me. I just always feel welcome when I'm there, and it's comfortable. And they're just all super cool chicks. It was so fun to see everyone stop by Mendi's booth, and show her their support. Jennifer McQuire, along with Kathy Rac and Kristina Werner, came by and I just knew my BFF Deneen would be super jealous to see me with them in this photo (Deneen is a HUGE fan of these amazing stampers). It was also fun to see Diana Waite, who was a familiar face I would see every year I attended CHA. So glad I got to meet Patricia Roebuck, as I've been a big fan of her work for years and have worked with her here and there thru Bella Blvd. It's always fun to hear what everyone is up too, and I loved chatting with Patricia about her new adventures. And Becki. I just love Becki, and she's truly one of my closest friends. She was on the Bella team for four years with me, and we became really good friends over those years. It was so awesome to finally meet her in person, and get to hang out together for a few days. I'd like to thank Mendi for the opportunity to travel to the show, and help out in her booth. It was such a fun experience, and I just loved being surrounded in the creative industry again. It's always something to be amongst such talented designers, surrounded by new products and creative projects using those new products. It's inspiring, to say the least. And just what I needed, as it reminded me that I miss being a part of the industry. Not sure what I'll do about that, but I do miss it. Hey all! I hate that I haven't been blogging. I miss it. Another thing that I've been missing? Scrapbooking. In the last 5 months, I have only created 4 layouts and 3 pocket page spreads. That's it, layout wise. And one of those layouts and one of those pocket page spreads I am unable to share in full. There's plenty of other projects that I've been working on, and I should really get each of them to the point where I can share what I've been doing. Instead of waiting to have the project fully finished. 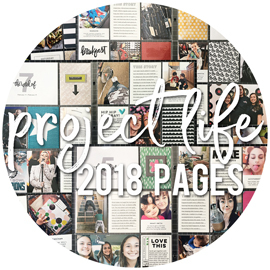 I mentioned in THIS POST, at the start of the year, that I was debating whether I want to do my Project Life albums this year with physical products - or digitally, with the Project Life app. I'm still debating if I'm being honest. I already had all of my January photos printed, just in case I want to do physical albums. I also dumped all of my January photos onto my iPad, just in case I want to use the Project Life app. Decisions, decisions. I have been playing with the app, creating a few pages here and there. Not necessarily pages for my Project Life album. More like digital layouts. I had quite a few soccer photos from January, so I thought why not toss together a quick page. There are things that I love about using the app to get pages done. It's incredibly easy. I can do it wherever, whenever. The fact that I can do it while sitting on the couch, watching my shows - that's awesome to me. It's simpler. There's no printing photos, digging out supplies, die cutting titles (because that's what I love to do), fussing around with pieces, printing journaling, photographing the layout, etc, etc. I'm just rambling. But at least I have a layout to share, right? I also promise to be back Monday, with a recap of my time at CHA two weeks ago. And I'm going to do my best to get one of my album projects ready to share later next week. If I wait till they're totally done, they'll never get shared. Lol. Hey all! I can't believe a full month has gone by since I last posted. I promise, I'll be back to sharing more projects soon. Life has just been busy lately, so there's been a little less creating going on here. I was thrilled to get an email a few months back asking if I would be interested in being a Guest Storyteller for Ali Edwards Story Kits. There was no hesitation on my part, and I jumped at the chance. I was asked to work with the Numbers Story Kit, and it was such a fun one! I actually had so many ideas for my two projects, that I had a hard time narrowing down what I would create. I ended up creating a pocket page spread, with a bit of a sarcastic twist, about "Being a Teenager By The Numbers" (thanks to my 17 year old for the inspiration), and a traditional layout about what items of clothing are most important (and one that's the least important) when it comes to me filling up my closet. If you're a subscriber to Ali's Story Kits, you can check out my contributions in the classroom (they just went up today). I had so much fun working with this month's kit, and I want to thank both Ali and Katie for inviting me to guest for them.